3 Stack Buttermilk Pancakes with bacon or sausage. 3 Stack Honeywheat Pancakes with bacon or sausage. 3 Stack Buckwheat Pancakes with bacon or sausage. Sour Dough French Toast with bacon or sausage. Italian scramble, sausage, roasted bell peppers, onions, tomatoes, diced red potatoes, shredded blend cheese, and eggs. Peppers & onions, fresh salsa, and cheese. Fresh roasted garden veggies with cheese. Diced ham, peppers, onions, and cheese. 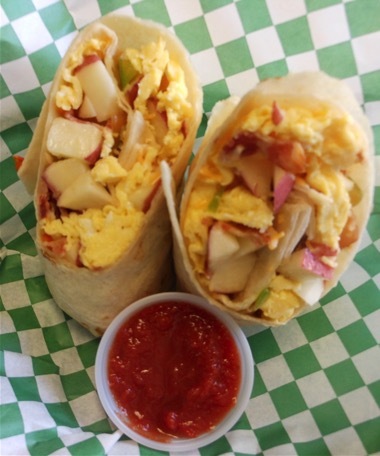 Eggs, potatoes, onion, tomato, cheese, salsa, and a choice of bacon or sausage. Layers of tortilla chips with refried beans, beef taco meat, nacho cheese sauce, and garnished with fresh pico de gallo and sour cream. Large tortilla stuffed w/Cheddar and Jack cheese, fresh pico de gallo, smoked chicken, and sour cream on the side. Available in 6 or 10 meaty wings with our yummy fries. Choose your sauce: Plain, Hot, Medium, Mild, Barbeque, Teriyaki, Garlic Butter Parmesan, Hotiyaki, or Cajun seasoned. Baked potato skins loaded with bacon and cheese. Served with sour cream. Great with the Marinara sauce. Fries loaded with melted cheese and bacon bits. Loaded Fries with a dollop of chili. Mushrooms fried in Cajun batter with sour cream on the side. Basket filled with our yummy fries. A basket of our crispy sweet onion rings served with ranch dressing. 3 mini beef cheeseburgers served with French fries. Garnished with lettuce, tomato, onion, and pickle. Two tacos topped with seasoned ground beef, shredded lettuce, pico de gallo, Colby cheese, and sour cream on the side. Served with chips and salsa. Battered Cod filets fried to a crispy crunch. Served with cole slaw. Our pizza is made from the freshest ingredients, lightly sauced, with the finest mozzarella cheese. Pepperoni, Italian sausage, bacon, ham, bell peppers, onions, tomatoes, or extra cheese. All sub sandwiches are served with french fries, onion rings, or cole slaw. Shaved, tender beef with onions, green peppers, and provolone on a fresh sub roll. THIS is what you came for! 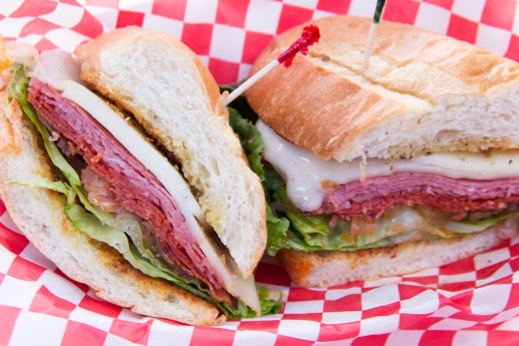 Dry salami, ham and genoa salami with provolone cheese, lettuce, tomato, and red onion on a sub roll. Italian dressing makes this a specialty. Marinated chicken breast with melted provolone cheese, lettuce, tomato, and red onion on a sub roll. Chicken breast never had it soooo good! 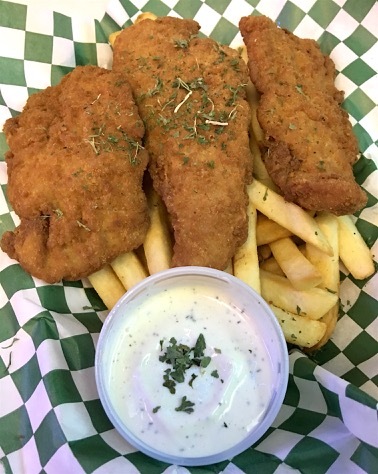 Spicy filets of breaded chicken served with lettuce, tomato, red onion, provolone cheese, with ranch dressing. Thinly sliced and grilled to perfection. Served with melted Swiss cheese and mustard on a sub roll. A half-pound burger with all the fixings on a toasted bun. Choice of American, Swiss, or cheddar cheese. A half-pound burger with Swiss and American cheese, bacon, and topped with onion rings and all the fixings. A half-pound burger, American cheese, bacon, and barbeque sauce, and topped with onion rings and all the fixings. A half-pound burger grilled with Cajun seasoning and topped with grilled onions, crumbled bleu cheese, and all the fixings. Try it! A half-pound burger, Swiss cheese, and grilled onions on rye bread. Yep, it’s a classic! Lettuce, tomato, bacon, and mayonnaise on grilled wheat bread with smoked turkey, ham, and American cheese. Thick Texas toast with grilled ham, and swiss, provolone, and American cheese. Don’t forget the tomato! 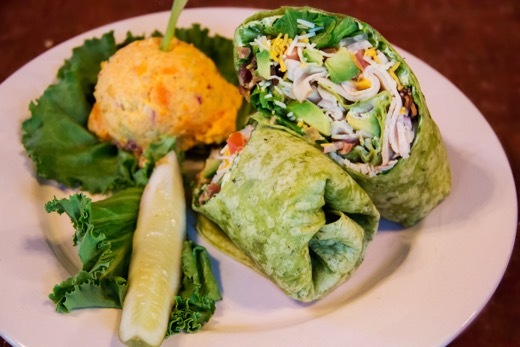 Buffalo chicken, chopped lettuce, tomato, onions, and bleu cheese dressing wrapped in a veggie tortilla. Romaine lettuce, parmesan cheese, red onion, and croutons. Dressed with Caesar dressing in a spinach tortilla. Lettuce, tomato, red onion, cheddar cheese, and wrapped with pesto cream cheese in a spinach tortilla. House Italian Vinaigrette, Ranch, Bleu Cheese, Caesar, BBQ Ranch, 1000 Island. Romaine & baby greens, tomato, cucumber, red onion and parmesan croutons w/dressing choice. Romaine lettuce with croutons, red onion, parmesan cheese, and Caesar dressing. Garlic chicken, romaine, red onion, shredded parmesan, croutons, with Caesar dressing. 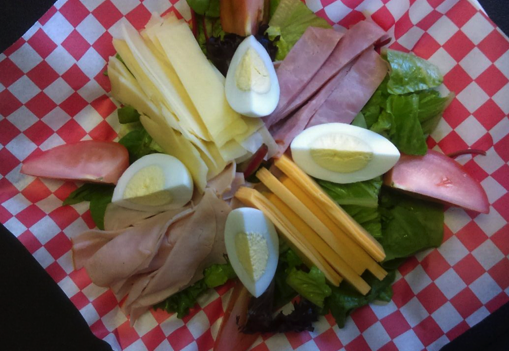 Chopped smoked turkey, black forest ham, romaine and baby greens, Swiss cheese, American cheese, hardboiled egg, tomato, and red onion, with choice of dressing. Garlic chicken, romaine and baby greens, tomato, bacon, hardboiled egg, black olives, crumbled Bleu cheese, and avocado, with choice of dressing.